The beginnings of the three young men who started Lamp Post Group were anything but high tech. They got their start with experience with one of the oldest industries in the world, one known to the ancient Egyptians: Producing bricks and moving them. Barry Large was born in Chattanooga, to a family involved in the old-school brick industry. General Shale was a well-known stone-products supplier with offices in Knoxville, Chattanooga’s upriver cousin, and he spent some of his early years there, but his parents were back in Chattanooga when they co-founded their own brokering business, known as Key-James Brick. Large attended McCallie, one of Chattanooga’s two well-known prep schools, where in seventh grade he met Allan Davis, another bright kid with a knack for the latest technology. He turned out to have some big ideas. In the mid-1990s, Large and Davis entered Samford University. The small, religious-based university is located in Birmingham, Chattanooga’s old iron-industry rival, and is regarded as one of the South’s top- ranking regional universities in U.S. News & World Report’s well-known annual polls. At Samford, Large and Davis met Birmingham native Ted Alling, where they were all members of the same fraternity, Sigma Nu. “We spent a lot of time together in college, socially and academically,” says Large, who studied history there. After graduation, Alling showed all the signs of settling down, engaged to be married and working for C.H. Robinson, one of the nation’s biggest freight brokerages. The job took him to Nashville, as Large stayed at Samford to get another degree, in business. They could have gone their own ways, as college chums tend to, settling in different cities, to see each other only at reunions. But a new venture—and Chattanooga—drew them. Alling’s successes in the freight brokerage business suggested a business plan for the three college friends. So by 2002, soon to be joined by the third Musketeer, Allan Davis, they formed what was essentially a logistics division of the Large family’s brick business. The Key-James connection constituted a big family advantage, and some young entrepreneurs might have been content just to cultivate transporting brick within the region. 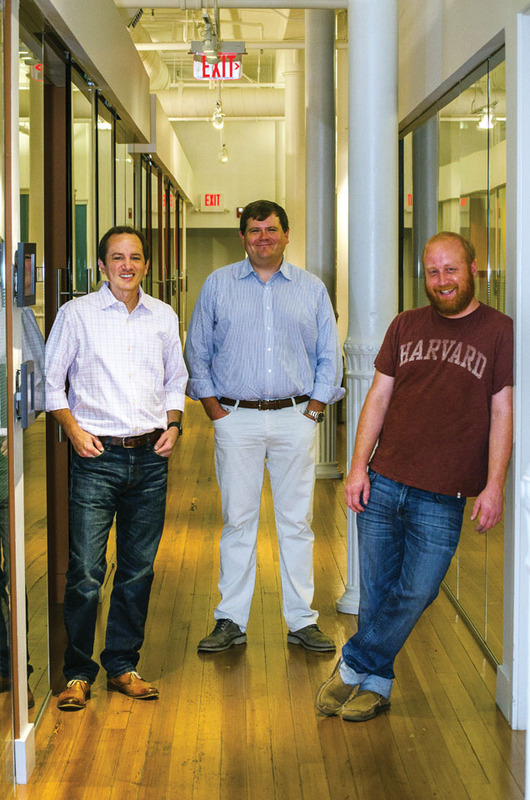 The resourceful trio moved quickly, though, as Large tells it, demonstrated by the shifting proportions of their client base. His father’s company accounted for 90 percent of their business the first year. But as they added clients—Komatsu, the Japanese heavy-equipment manufacturer, was an early one—and grew their business, the family advantage shrank. The Larges’ business just accounted for 50 percent of their business the second year, then 12 percent—reflecting the growth of a new client base on the free market. John Deere, Volvo, Caterpillar liked the way this team did things. 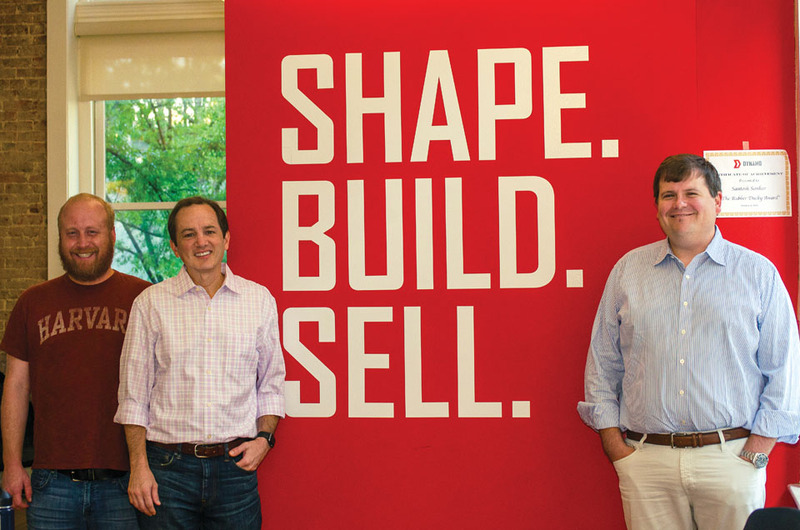 By year 5, they’d built the company to such a degree that their original family client was less than 1 percent of their business, suggesting an amazingly rapid growth and a very broad business base. By then, the young trio’s company was known—pretty well-known, in fact—as Access America. It was a high-growth, high-revenue business. Large still seems dumbfounded by what they accomplished. “We didn’t really deliberately do it,” he says. Different client queries concerning different jobs pushed them to expand in unexpected ways. One client only wanted to deal with a company that owned their own trucks, so they bought a few that became the core of a fleet of trucks known as AAT Carriers. A job moving missiles and ammunition demanded that they own more insurance, so they started their own insurance brokerage, known as Reliance. 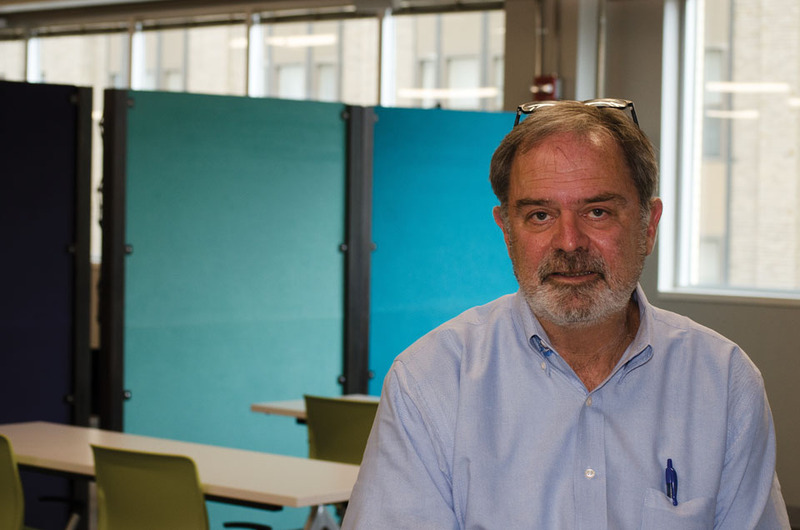 He credits his colleague, Allan Davis, whom acquaintances call the “computer nerd” of the trio, with coming up with a bold new idea: a for-profit venture incubator, a sort of prep school for tech businesses. They’d call it the Lamp Post Group. It’s an old-fashioned image for a new idea. Hays sees LPG as the next phase of Chattanooga’s evolution, citing its origins well over a century ago, riding the wave of the Industrial Revolution and fresh, creative entrepreneurship. This intuitive spin-off approach suggested a broader ideal that may have reflected the wide-open, technologically driven spirit of their municipal home base. Large says they didn’t do much deliberate research about whether to launch their ventures in Chattanooga, but it turned out to be the ideal place, at an ideal time, during what was becoming known even in other cities as the Chattanooga Renaissance. Perhaps without deliberately intending to, they helped boost the Renaissance into the new century, and became one of its more dynamic elements. “Lamp Post Group codified what had happened to us, without any deliberate plan,” Large says. 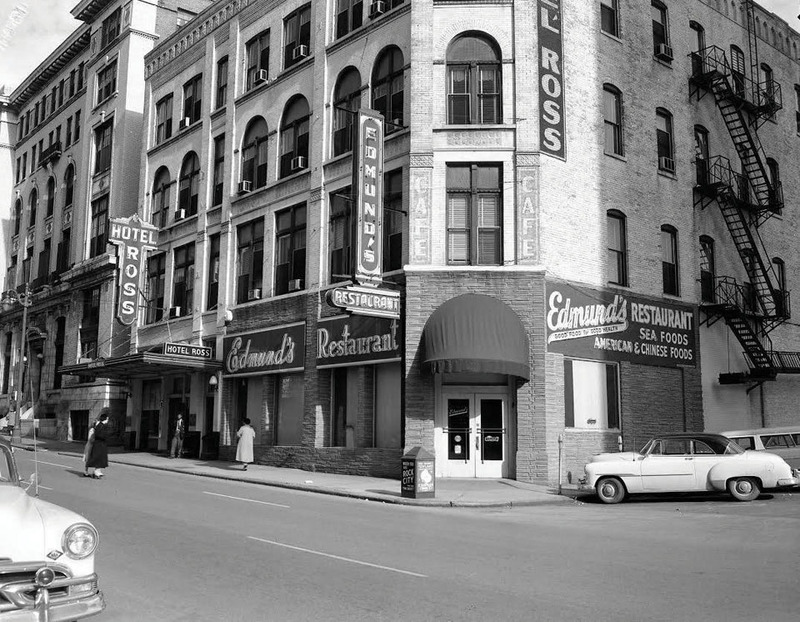 The old Ross Hotel, pictured above in 1928, closed and re-opened as a handful of establishments until Lamp Post Properties renovated and reopened it in 2017 as the Tomorrow Building, right, a “micro-living” concept located in the city’s Innovation District. Seeking a downtown location, their new Lamp Post Group found an interesting problem called the Loveman’s Building. The huge, elaborate 1890s department store building on Market Street, in the center of Chattanooga’s reviving core, had long been considered one of the urban revival’s biggest challenges. The closure of the iconic building’s namesake store, soon after the much-heralded Tennessee Aquarium had opened, was a cloudy spell in what was supposed to be the city’s sunniest day. The building Loveman’s left behind looked like a white elephant in the middle of reviving downtown Chattanooga, and turned out to be one of the more ambitious renovation projects of the era. Lamp Post purchased the second floor of Loveman’s, and renovated it as their 31,000 square-foot headquarters, which would include both Lamp Post’s offices and those of some of their startups. LPG has invested in that aggressive idea in a real sense, establishing Lamp Post Properties in 2016. They took the concept of diversification of assets into a whole new dimension when this project that began as a freight-logistics concern became involved in real-estate development and historic preservation of major urban landmarks. 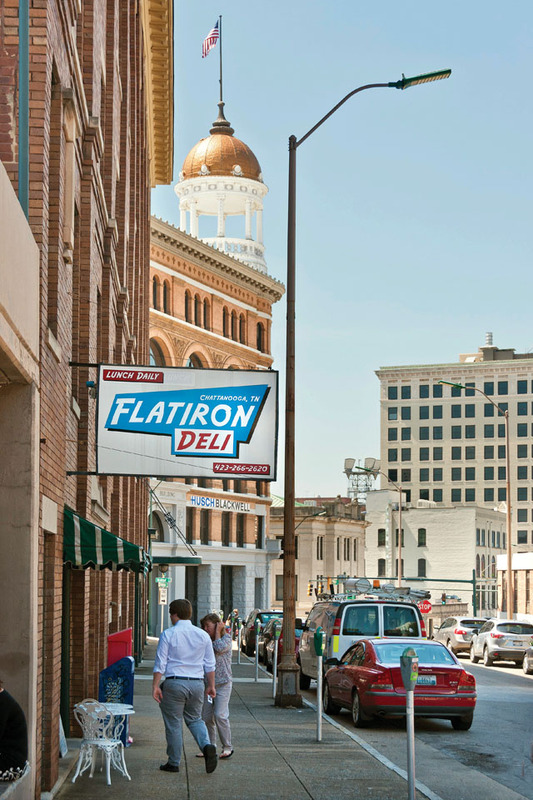 With partner Miller Wellborn taking the lead, LPG began buying mostly historic old buildings in the downtown area. In 2015, they announced that the century-old Ross Hotel, a boarded up, almost unnoticeable old building known more recently for a business called Yesterday’s, would be rehabbed with creative internal and external design. It would be known—in playful contrast to its recent identity—as the Tomorrow Building, a mixed-use structure with 39 “micro-apartments.” The new residences would be available to the public, but located in the Innovation District, especially appealing to startup entrepreneurs. 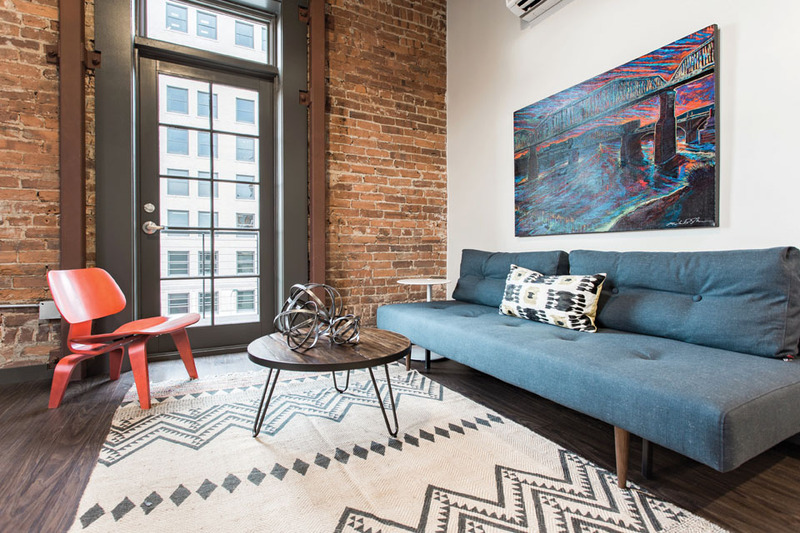 It’s billed as the first “co-living” development in the Southeast, offering a new, less expensive style of living arrangement, in which several unrelated roommates share a kitchen and other amenities. The ideal, as in the case of some new workplaces in Chattanooga, is to increase dialogue and exchange of ideas among creative people, even at home. After the Loveman’s project and the Tomorrow Building, LPG bought a century-old Elks Club and renamed it the Mayfield Annex. It became home to VaynerMedia, the New York-based social-media advertising company. Meanwhile, also nearby in the Innovation District, the distinctive old ornate and razor-thin Hotel Key became One Central Plaza, and home to LPG -associated businesses Reliance Partners and Steam Logistics. In the near future, another Lamp Post Properties project, The Co-op, will offer collaborative workspace on Cherry Street, and an old Chevrolet dealership will become an expanding distillery called the Tennessee Stillhouse. Launching a whiskey company in a town where distilling is illegal was a risky move—but one that paid off for the founders of Chattanooga Whiskey. 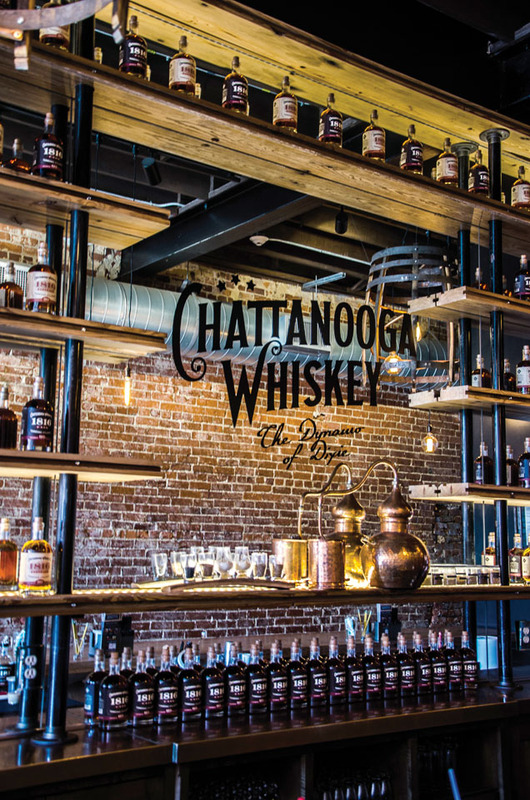 After successfully campaigning to reverse a prohibition-era law, the company set up a micro-distillery in downtown Chattanooga with plans to open a larger facility in 2017. You can look around the old Loveman’s Department Store building and see the diversity of what LPG has accomplished, and is accomplishing. 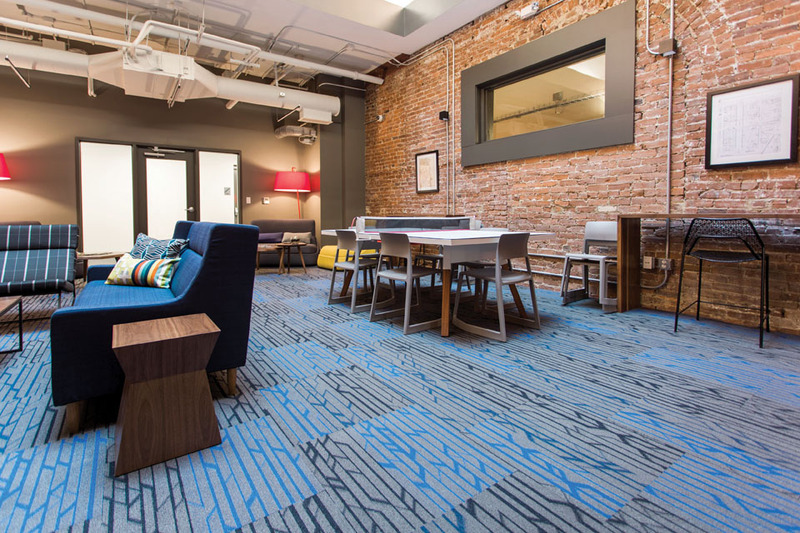 Most of LPG’s startups are very small, and many of them work in adjacent office suites in the Victorian edifice, 150 employees, over 31,000 square feet of shared office space. Several of them bear a strong resemblance to their parent company. Supply Hog, whose winking motto is “Get Ship Done,” is an unusual hardware and building materials shipping concern which uses e-commerce to aid heavy-duty transportation. They have business in most of the 50 states. 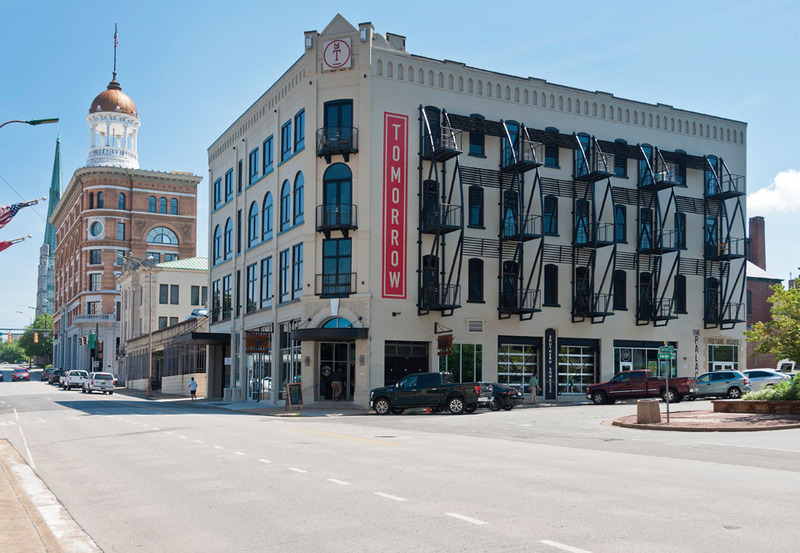 Billed as the first co-living development in the Southeast, the Tomorrow Building offers a new, less expensive style of living, in which several unrelated roommates share a kitchen and other amenities. Some of LPG’s apples fall far from the tree indeed. PandoDaily is an offbeat online journal of progressive thought. If the Atlantic Monthly was surprised at the overt Republican conservatism exhibited by some LPG principals, you don’t get that impression from PandoDaily, which is named for the extensive and intertangled roots of Utah’s pando tree. The publication’s motto is “Speaking Truth to Power.” More often than not, it does so from a tech-savvy perspective. Nooga.Com, launched in 2011, is essentially an online local newspaper, an adaptation of journalism for an especially challenging new century. The multi-platform website, which connects to all the social media, has already developed a reputation as a quick online site for news in the Chattanooga area, from politics to the arts. It also offers the inside scoop on much of Chattanooga’s latest tech developments. Fancy Rhino is a creative content provider with a track record of making video projects ranging from commercials to documentaries. Build Me a World, a documentary about predominantly black Howard University, is one of their prides. Their creative products have earned national praise. Torch makes an Internet router that Alling likens to “parenting in the digital age.” It offers families some control over what children can access within the home on their computers. FanJam is a daily fantasy basketball smartphone application. ReadyCart provides an accessory to YouTube that streamlines online promotions and purchasing. It was highlighted by Forbes Magazine in 2014 as one of “Final Five” impressive companies run by people under 30. StuRents is a website that helps students find both ideal housing and ideal roommates. PriceWaiter offers an array of automated assistance to online buyers and sellers, including a feature that alerts the buyer to prescribed low prices on online auctions. Bellhops is a tech-enabled, well-organized moving company, Chattanooga-based, but with a presence in several cities. Maybe it’s a whole new hip kind of Double Cola. Is it too big a leap to suggest that Chattanooga Whiskey harks back to Chattanooga’s 140-year reputation as a producer of fun beverages? But it’s not necessarily an act that will end. Admitting he’s speaking for himself, he says he will never reach any sort of final goal, and that’s the way he likes it. “It’s perpetual,” Large says of LPG. “We do this because we love it, not because we have to. Coming to work is a joy. And there’s no end in sight.